One of the initiatives I oversee here is our wonderful online Library Shop. 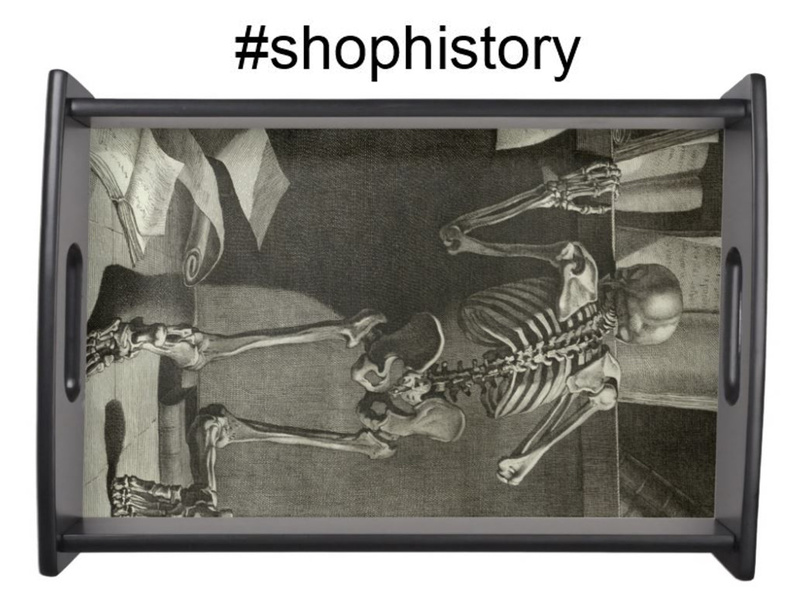 It features public domain images from our collection on various products. It’s a way for you to take a piece of the library home. Are these two hundred, four hundred, six hundred-year-old images edited? No. We keep our images unedited to preserve their historic integrity. The little warps in the vellum, the darkening on the edges of pages from centuries of fingers turning them, little spots of ink or stains from years of use are all part of the life story of each book. That said, here’s the “mostly” part. Many of the images used on the shop come from very old books. Books of any age usually don’t lie flat, and certainly not really old ones with big, beautiful bindings. To scan images, our books lie in a cradle; each side propped up by a wedge. This means an image in the initial scan is often at a slight angle. You don’t see it square on. Monstrorum Historia in the scan bed. Cockeyed images aren’t the most visually pleasing, moreover the images sit true on the book pages themselves. Therefor some of our images are rotated after scanning to correct for the angle introduced by that cradle in the scan bed, as in the example below. A real treat came for me when I got to work with this glorious image from the Italian naturalist Ulisse Aldrovandi (1522-1605). This is a phoenix from Monstrorum Historia, a volume in a set of encyclopedic works on animals. In Monstrorum, Aldrovandi documented and illustrated anomalous creatures both observed and imagined. The phoenix is a mythological bird that cyclically regenerates or is reborn from the flames and ashes of its previous self. For the special occasion of the Academy’s 2017 Gala, I was going to edit the background from this image to show just the bird itself. Far more elaborate image editing than I typically get to do. (Part of this was actually done with an editing tool called the “Magic Wand” which struck me as very fitting.) I edited out most of the background and zoomed in to tidy up the image. I started to notice these strips of “fuzz” all over. Zooming in even closer –around 200% magnification– I realized, “These aren’t fuzzy strips; I’m seeing the impression of the text from the page behind this!” The text from page underneath the phoenix page wasn’t removed with the layer of background (that tan parchment color), so it was now more starkly visible. The quality of the 17th century printing was so high and the scan was so powerful that not only had the page with the phoenix itself been captured, but the words from the page beneath as well. Not an official palimpsest (a piece of writing material with traces of previous or even removed writing still visible); but a delightful discovery in my scanned image. Cross-posted at The Biodiversity Heritage Library blog. The New York Academy of Medicine Library has contributed nine digitized titles (11 volumes) on medical botany to the Biodiversity Heritage Library (BHL) as part of the Expanding Access to Biodiversity Literature project. It is very exciting to share some of the Academy Library’s botanical resources with the wider public. While the Library’s collections include a large number of printed botanical books dating back to the beginning of the sixteenth century, for this project we were interested in identifying resources that could be sent to the Internet Archive for external digitization, which meant that we concentrated on our holdings from the second half of the 19th century forward through 1922. After generating lists from our online catalog, we checked to see if any of these resources had already been digitized by the BHL, Internet Archive, or HathiTrust. For this process, we developed a set of simple guidelines. Resources not available via BHL, Internet Archive or HathiTrust remained on the list. Resources already available via the BHL were eliminated from the list. Resources already available via the Internet Archive were eliminated from the list because BHL harvests content from the Internet Archive, so there would be no need for us to digitize that content. Resources already available via HathiTrust could still potentially be digitized for access via the BHL based on whether our copy provides additional information for the public once digitized. For example, the Indian Medicinal Plants (Kīrtikara & Basu, 1918) has been partially digitized by HathiTrust, but the volume with the images was missing. As such, it became important for us to digitize so that it would be fully available. We went through multiple lists and rounds of de-duplication to narrow down our potential submission. Once we finalized the list, Scott Devine, Head of Preservation, conducted a conservation assessment to determine which resources could be sent out for digitization and which were so fragile that they could only be digitized in house. We separated these into two lists. The first list was sent to the Internet Archive for digitization and is our contribution to BHL. The second list will be a project for our new digital lab and we hope to make them available at a future date. Indian Medicinal Plants (1918), plate #256 showing Leea Sambucina. The Indian medicinal plants (Kīrtikara & Basu, 1918) stood out as a resource to digitize and share widely. It documents the medicinal plants found in India. The authors describe a need to provide a text that reproduces illustrations of Indian medicinal plants from other works since there were few prior to this publication. Dr. W. Roxburgh’s text, reprinted in 1874, was used as a reference throughout. Although Indian medicinal plants did not focus on the use of plants in the development of drugs, this theme can be seen throughout the resources submitted to the BHL. Each author grapples with the role of plants in the creation and production of drugs. A course in botany and pharmacognosy (1902), plate #1 showing organized cell-contents. In A course in botany and pharmacognosy (1902), Henry Kraemer, Professor of Botany and Pharmacognosy, defines pharmacognosy as the “study of drugs of vegetable origins.” Kraemer devotes the first part of his text to plant morphology and the second part to pharmacognosy. In addition, he provides illustrations to aid in the study of both parts so that students can connect the descriptions throughout the text to the visual representations. Pharmaceutical Botany (1918), fig 57 showing leaf bases, species and compound leaves. Youngken’s Pharmaceutical botany, 2nd edition (1918) was expanded to take advantage of the growing area of botany, including a section on drug-yielding plants. The text focuses on the morphology and taxonomy of plants used in drug development. In Pharmacal plants and their culture (1912), Schneider argues that the majority of imported plants used in medicine could already be available in the United States. He focuses on California and outlines what can be cultivated and grown in the state. Schneider provides a list of uses and common names. The medicinal plants of Tennnessee (1894) is an observational inventory of Tennessee’s plants and their descriptions based on a similar project conducted by North Carolina. Published by the Tennessee Department of Agriculture, the report emphasizes the importance of documenting and understanding the native plants of Tennessee and how they can help increase usage and revenue. Overall, readers of this collection can begin to understand the role of plants in the creation, development and economic viability of drugs. Many of the resources provide some form of inventory, index or list that documents the plants and associated drugs. Baillon, H. (Henri). (1878). Programme du cours d’histoire naturelle médicale professé à la Faculté de médecine de Paris. 3ème partie, Etude spéciale des plantes employées en médecine. Paris : F. Savy. Gattinger, A., & Allison, T. F. P. (1894). The medicinal plants of Tennnessee : exhibiting their commercial value : with an analytical key, descriptions in aid of their recognition, and notes relating to their distribution, time and mode of collection, and preparation for the drug market. Nashville, Tenn. : Franc. M. Paul, Printer to the State. Kīrtikara, K. R., & Basu, B. D. (1918). Indian medicinal plants (Vol. 2nd ed. (1918)). Bahadurganj, India : Sudhindra Nath Basu, Pâninî office; [etc., etc.]. Kraemer, H. (1902). A course in botany and pharmacognosy. Philadelphia : [Press of Edward Stern]. Meyer, T. (1911). Arzneipflanzenkultur und Kräuterhandel : rationelle Züchtung, Behandlung und Verwertung der in Deutschland zu ziehenden Arznei- und Gewürzpflanzen ; eine Anleitung für Apotheker, Landwirte und Gärtner. Berlin : J. Springer. Moquin-Tandon, A. (1866). Éléments de botanique médicale : contenant la description des végétaux utiles à la médecine et des espèces nuisibles à l’homme, vénéneuses ou parasites, précédée de considérations sur l’organisation et la classification des végétaux (2. éd.). Paris : J.-B. Baillière et fils. Schneider, A., & California. State Board of Forestry. (1912). Pharmacal plants and their culture. Sacramento : Richardson, Superintendent of State Printing. Velásquez, M. A., & Maldonado, A. (1920). Contribución al estudio de la materia médica peruana. [Fasciculo I-III. Lima : Sanmarti y ca. Youngken, H. W. (Heber W. (1918). Pharmaceutical botany (2d ed., and enl., enl.with 195 illustrations.). Philadelphia : P. Blakiston’s Son & Co. The BHL Expanding Access project is funded by the Institute of Museum and Library Services (IMLS). 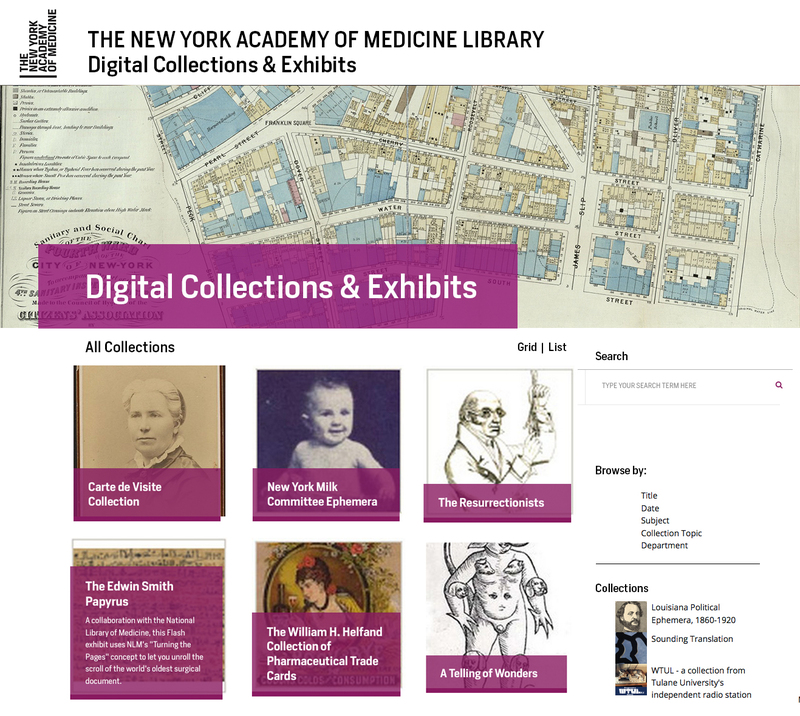 In 2015, The New York Academy of Medicine Library embarked on a mass digitization project with the Medical Heritage Library (MHL), a digital curation consortium. Over the course of two years, the Academy Library along with MHL collaborators digitized state society medical journals from 48 states, the District of Columbia and Puerto Rico. The Academy Library contributed state medical journals from 37 states, which accounted for 716 volumes of the digitized content now available. Today, you can find, 97 titles, 3,816 volumes and almost 3 million pages of digitized journals on the Internet Archive. Digitizing the medical journals of state societies has been an amazing experience for the Library and it is a significant contribution to preserving our cultural heritage and making it accessible to anyone with an internet connection. Researchers and the general public now have access to a major resource on medical history that includes journals from the 19th and the 20th centuries that would not otherwise be available to the public. “One of the great values of having the state medical journals online is the willingness to provide full-text digital content for materials that would normally be available only with limited content because they are still in copyright,” says Arlene Shaner, Historical Collections Librarian. A quick exploration of the journals can be the catalyst for a deeper research project across many disciplines. For example, what style and design trends can be identified from the covers of the Illinois Medical Journal? Illinois Medical Journal through the years. This is the second in a two-part series on the creation of the Academy Library’s Digital Collections and Exhibits website. Part 1 is here. Sometimes opportunities arise that you just can’t pass up. In late May 2017, our Curator of Rare Books and Manuscripts, Anne Garner, suggested a digital exhibit of items from our collection that would showcase the history behind many of the magical elements from J.K. Rowling’s beloved Harry Potter series; and suggested its launch coincide with Harry Potter and the Philosopher’s Stone‘s 20th anniversary on June 26. While we were a new digital team of two with new digitization equipment, we were up for the challenge. That is how we wound up creating the online exhibit, “From Basilisks to Bezoars: The Surprising History of Harry Potter’s Magical World,” in a mere 6 weeks. 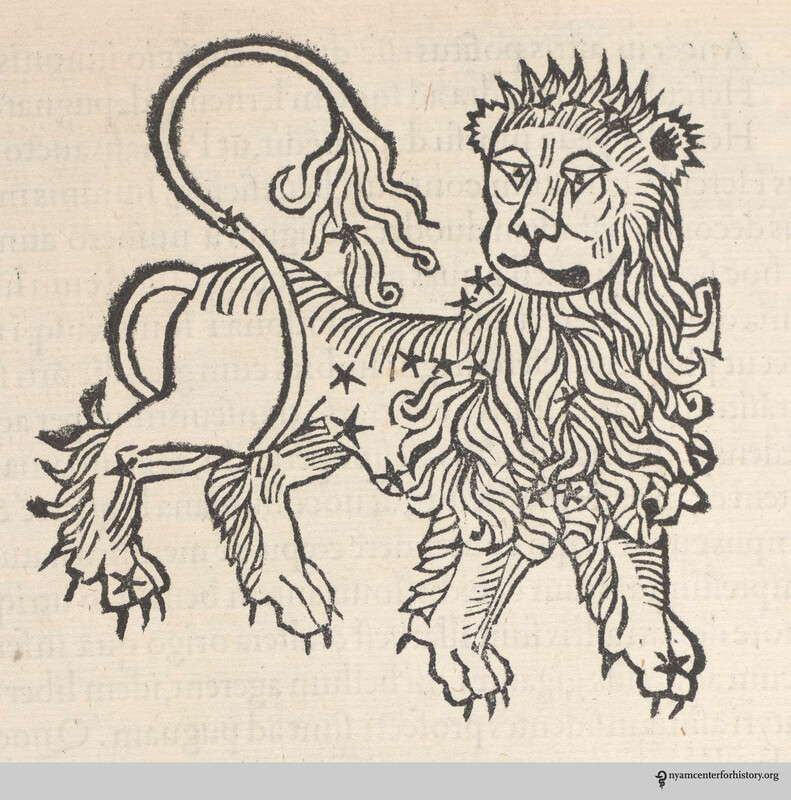 Leo from Aldus Manutius’ Astronomici veteres (1499). Our first stop was to Garner, who, within a week and a half, handpicked two objects (including our infamous bezoar) and 34 images from over 20 different books for us to digitize. While we were hustling to photograph these items in the lab, Garner was busy creating robust image metadata for us to ingest into Islandora. Next, we got to work churning out XML records through the use of OpenRefine and an Apple script, and then we were in the quality assurance phase. Once everything was checked, it was time to launch! Of course, there were bumps along the road, too. At one point, we realized we had digitized the wrong phoenix! At another point, we had to go into all of our XML records and manually add in a download button. There were also some late Friday and Sunday nights spent working on our laptops to make the collection as perfect as possible. Bumps notwithstanding, we launched on-time, and the collection received a lot of great attention. Anne Garner takes us through the images she has selected for digitization for our Harry Potter-inspired collection. So, what did we learn from the launch of our digital program? We quickly discovered that it takes time and skill to create metadata. Both Garner and our Head of Cataloging, Rebecca Filner, expertly provided us with extremely detailed metadata for our current collections. Even in its quickest iteration, metadata-creation takes weeks! Our Head of Digital, Robin Naughton, trying out the new equipment. And finally, we learned that the easiest part of the digitization process is photographing the items. As long as your equipment works, you are good to go! We received training by our expert Conservation staff in how to handle rare items, and we hit the ground running. First, reach out to local colleagues who have been doing this longer than you. We visited many digital labs before our launch, including the beautiful labs at Columbia University, The Frick Art Reference Library, and the Museum of the City of New York. Each lab had a different setup, different workflows, and different amounts of staff with unique backgrounds. Without this exploratory research, we have no doubts our lab would not have done as well as it has. Second, join listservs. Without the listservs to which we subscribe, we would not have gained nearly as much knowledge as we did before launch. Two great listservs to join are ALA’s digipres listserv and the ImageMuse Yahoo group’s listserv. We even reached out to a wonderful colleague from Coastal Carolina University because we admired how he used OpenRefine and the command line to batch-create and –export XML metadata records. He shared his script with us, and the rest is history. We now use his workflow in our lab for nearly every project. Now we are even sharing our knowledge with others! Third: join or create a digitization-related community in your area. By way of using the free, open-source Islandora platform for our digital collections, we became part of a very active and supportive network of Islandora admins, managers, developers, and vendors around the world. While that is incredible, it is also nice to have a support system in your own backyard. So, we co-founded the New York City Islandora Working Group with some colleagues from other institutions. Our group is open to anyone, regardless of whether they currently use Islandora. We meet once per month and share skills, ask each other questions, and, of course, eat pizza and sip wine together. It’s one of the most worthwhile professional endeavors we have been a part of, and our members have been instrumental in getting our lab up and running. The secret to success really is communication. Talk to people, and you will learn so much! For those library-science fans among you, why didn’t we just pull the metadata from our online catalog? We did! But we encountered a lot of library-speak that we did away with for our Digital Collections audience and wanted to add some new metadata. There is a moment before a system is officially live when all the pieces align to create perfection. That moment arrived for us on June 5, 2017, when we launched our Digital Collections and Exhibits website. The launch represented the culmination of 18 months’ work towards implementing a new digital software system (Islandora), migrating content, digitizing new material, and building an internal digital lab. We took a structural approach to this undertaking. The first structure we wanted to tackle was our software. We selected Islandora, an open-source software framework, which offered an active community and support for small institutions. The community was a major driver in our decision. We wanted support from a diverse group of people who included librarians, software developers, and administrators. To get our Islandora instance set up, we opted for a vendor-hosted solution. Since we were new to the system, and had a small team with no developers, this was the best move for our institution. Out of a few different vendors, we selected DiscoveryGarden. They were instrumental in getting our system up and running (including customizing our theme to align with the Academy’s branding). We ended up with an amazing homepage that shows users all the resources the Library has to offer. Wireframe for new theme development (Left). Design mock-up for theme (Right). 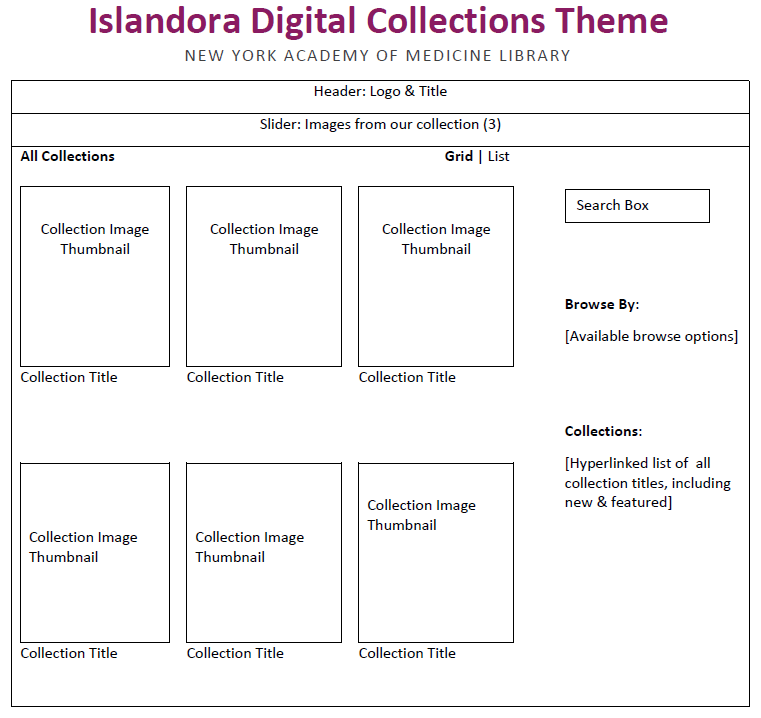 Next, we shifted our focus to the content: what would fill the pages of our Islandora repository? A few years prior, courtesy of George Blumenthal, photographer Ardon Bar-Hama took photographs of some of the Library’s rarest books. We determined that co-opting already-digitized content would be the perfect first project for our new system. Better still, Anne Garner, the Library’s Curator of Rare Books and Manuscripts, had already written descriptions for these images. With the help of digital assistants, volunteers, and interns, the images were cropped, separated, and augmented with robust metadata. 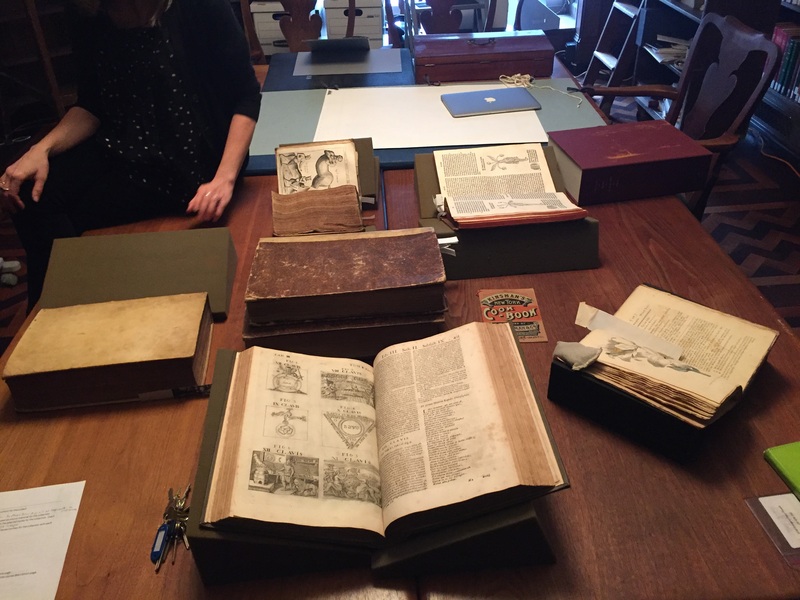 This project alone gave us 13 rare books to showcase in our repository without requiring any new digitization. For our next project, we explored migrating an older digital collection from our legacy system, ContentDM, to our new Islandora system. We chose the William H. Helfand Collection of Pharmaceutical Trade Cards because the digitization that took place almost a decade prior had not captured the entire run of the collection. So, not only could we migrate the old content from ContentDM, we could also add new content. The previously-digitized cards from the William H. Helfand Pharmaceutical Trade Cards collection on ContentDM. At the same time as all of this pre-launch processes were taking place, we were also building our physical digital lab. 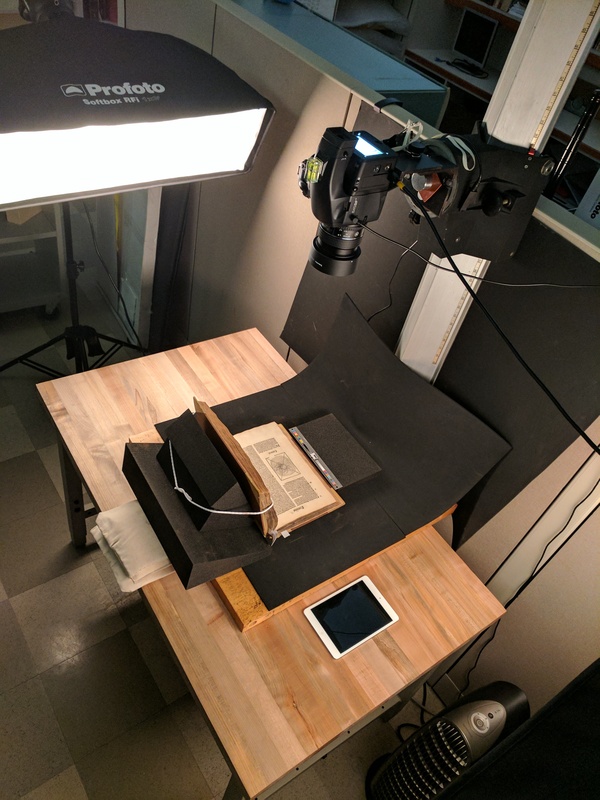 We purchased a refurbished digital, medium-format camera, strobe lights and Capture One software for cultural heritage institutions, dusted off an old copy-stand we found hiding out in the Library, and outfitted it on top of a workbench to serve as our digitization environment. Building a digital program takes time and resources. We are fortunate to have a supportive institution and to be part of a very active community that has done, is doing, and planning to do the same or similar digitization projects. On the morning of June 5, 2017, everything worked. The launch was a success, and the feedback we received was stellar. Coming up in part 2, we will take you through the creation process behind our Harry Potter-inspired digital collection; go over general lessons we learned over the past 2 years; and share some recommendations for those of you thinking of starting a digital lab of your own. Our digital lab setup. We’re ready to digitize everything! For those of you who like to get into the nitty gritty of digital asset management, in order to migrate these legacy Helfand scans from ContentDM to Islandora, we exported the ContentDM metadata into Excel spreadsheets, conducted an inventory of these original images, added to the inventory data related to the new items we were putting into the collection, and voilá! When Hogwarts librarian Irma Pince first appears in book one of the Harry Potter series, published twenty years ago this week, she is brandishing a feather duster and ordering young Harry out of the library where he’s pursing the noble (and ultimately world-saving) task of looking up the alchemist Nicholas Flamel. Drs. Barry and Bobbi Coller Rare Book Reading Room. Pince doesn’t exactly scream poster-child for open access. And yet, a chance look at our card catalog recently revealed that the Academy Library might have something in common with Hogwarts, aside from its ambiance (The Library’s Drs. Barry and Bobbi Coller Rare Book Reading Room, nestled on a locked mezzanine level of the Academy that visitors sometimes call its “Hogwarts floor,” frequently invites comparisons.) That something is our collections. To celebrate the twentieth anniversary of the publication of J.K. Rowling’s Harry Potter and the Philosopher’s Stone, The New York Academy of Medicine Library has launched a special digital collection, “How to Pass Your O.W.L.s at Hogwarts: A Prep Course.” Featuring rare books dating back to the fifteenth century, the collection reveals the history behind many of the creatures, plants and other magical elements that appear in the Harry Potter series. The digital collection is organized as a fictional study aid for Hogwarts students preparing for their important magical exams, the O.W.L.s. The collection is organized into seven Hogwarts courses, featuring historical content related to each area of magical study. For example, the Transfiguration section focuses on alchemy and the work of Nicholas Flamel—a historical figure who is fictionalized in Rowling’s books. Both Harry Potter and the Philosopher’s Stone and seventeenth century scientific literature represent Nicholas Flamel as an important alchemist responsible for achieving the philosopher’s stone (the real Flamel was a wealthy manuscript seller, and likely never an alchemist himself). Salmon, William. Medicina Practica, or the Practical Physician, 1707, featuring Nicholas Flamel’s Hieroglyphics. The collection’s Care of Magical Creatures section features spectacular centuries-old drawings of dragons, unicorns and basilisks—plenty of prep material here to keep the attention of young wizards during this third year elective course. The early naturalists Conrad Gessner and Ulisse Aldrovandi both devoted entire volumes of their encyclopedic works to serpents. Some illustrations depicted snakes as we might see them in the natural world. Others celebrated more fantastical serpentine creatures, including a seven headed-hydra and a basilisk. Said to be the ruler of the serpents, the basilisk (from the Greek, basiliskos, for little king) looks a little like a turtle with a crown on his head. Aldrovandi, Ulisse. Serpentum, et draconum historiae libri duo…, 1640, pp. 270-271. Aldrovandi, Ulisse. Serpentum, et draconum historiae libri duo…, 1640, p. 363. Off campus proves to be where the wild (er) things are. In book one of the series, Voldemort gains strength by ingesting the blood of a unicorn. Rowling’s unicorns have healing properties and can act as antidotes to poison. The qualities Rowling assigns to these beautiful and rarest of beasts echo their characterization in early modern natural history texts. Several of these works —illustrated encyclopedias that depict and describe both real and fantastic animals in the sixteenth century—present the unicorn as powerful healers. We’ve written already about the French apothecary Pierre Pomet’s illustrations of the five types of unicorns, and his assertion in his 1684 history of drugs that unicorn horns sold in most apothecary shops were actually the horns of narwhals. Conrad Gessner’s 4500 page encyclopedia of animals, the Historia Animalium, also includes a depiction of a unicorn (below). Gessner writes that unicorn horn and wine together can counteract poisons, and assigns it other efficacious properties. Gessner, Conrad. Thierbuch das is ein kurtze b[e]schreybung aller vierfüssigen thiern so…, 1563. In Harry Potter and the Philosopher’s Stone, we meet a band of spirited and enigmatic centaurs in the Forbidden Forest. Centaurs and mer-people fall into a category throughout the series of what Rowling refers to as “half-breeds”: hybrid creatures who are part man or woman, and part animal. This category of beings is often diminished for being somehow less than fully human. In the books, half-breeds don’t have the civil rights that other wizarding folk have. Hagrid, Dumbledore, and others are sympathetic to the creatures—In Harry’s fifth year, Dumbledore appoints one as Hogwarts’ Divination Professor. Schott, Gaspar. Physica curiosa; sive, Mirabilia naturae et artis libris XII…1667, p. 357. While the History of Magic taught at Hogwarts is largely fictional, the Academy Library contains books in the real-life history of magic, including the 1658 manual Natural Magick by Giovanni Battista della Porta and a manual for witch-hunters by della Porta’s rival, Jean Bodin—two highlights of the digital collection. Another featured treasure is an actual bezoar (ours comes from the stomach of a cow, ca. 1862), and is used as a key potions ingredient by Hogwarts’ students. New and enhanced scans created? Check. All collections uploaded to repository? Check. Then, we’re ready for take-off. We are very excited to announce the launch of our new digital collections and exhibits website. Starting in 2016, we began working with Islandora, an open-source framework that provides a robust infrastructure for digital collection development. Our goal was to migrate old collections and develop new digital collections. Islandora offered a solution that was extensible, easy to use, and built on a foundation that included a preservation-quality repository (Fedora), one of the most extensible content management systems (Drupal), and a fast search (Solr). With this base, we set about designing the interface, migrating and developing collections, and working to build a digital collection website that would make it easy for the public to explore the amazing collections available at the Library. You can find us at digitalcollections.nyam.org. The homepage of the website will be your guide to our collections. There you will find a showcase of our treasures from rare medieval manuscripts to 19th century advertising cards. 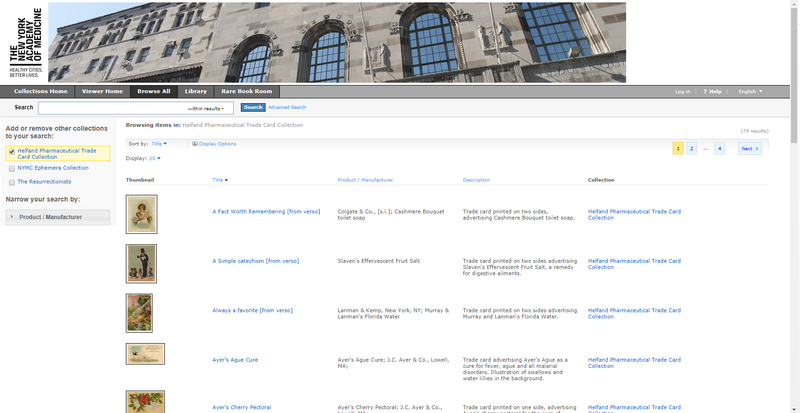 From the homepage, you can access a collection by clicking on the image for that collection, search for particular terms using the search box on the right, and browse recently added collections just below the search. As you explore a collection, you will find that some use the Internet Archive BookReader to provide the experience of turning the pages of a book, while others appear similar to image galleries. Regardless of the collection design, you can learn more from the descriptive metadata below the object, zoom in on a specific area, and download a copy of the image. The William H. Helfand Collection of Pharmaceutical Trade Cards was donated to the Library between 1986 and 1992 by Mr. Helfand, a leading collector of medical ephemera. The collection includes approximately 300 colored cards produced in the United States and France in the mid-nineteenth century that advertised a variety of goods. For example, if you’d like a cure for your corns and bunions, then “Ask Your Druggist for Hanson’s Magic Corn Salve.” Maybe you’d like a solution that will work for multiple ailments such as “Ayer’s Cathartic Pills: the Country Doctor.” Whatever your ailment, chances are pretty good you will find something in this collection that offers a solution. As part of the Library’s early digitization efforts and grant funding in the early 2000s, half of the collection was digitized. This project digitized the rest of the collection. For the first time, the complete collection, duplicates and all, is available to the public. Researchers and the general public can explore these trade cards in new and novel ways to gain an understanding of the collection as a whole. The majority of the metadata on the cards are hyperlinked so that users can easily find information. For example, if you were interested in a particular manufacturer such as “D. Jayne and Son,” then you can click on that manufacturer’s name to find all the cards associated with that manufacturer. Also, if you’re curious about all the cards with cats or dogs, then you can search the collection for “cats” to see how many cats appear on trade cards or “dogs” for the number of dogs in our collections. Let us know how many cats or dogs you find! The website includes a glimpse into our rare and historical collections material. In one day, high-end photographer, Ardon Bar-Hama, courtesy of George Blumenthal, took photos of a subset of the Library’s treasures. For example, if you’re interested in cookery, you can page through our Apicius manuscript with 500 Greek and Roman recipes from the 4th and 5th centuries. Maybe you’re interested in Aristotle’s Masterpiece, or you just want to see the most beautiful anatomical images from Andreas Vesalius’s De Humani corporis Fabrica, or a skunk-cabbage (Symplocarpus Fœtida) hand-colored plate from William P. C. Barton’s Vegetable Materia Medica. Whatever the interest, this collection offers a broad range of materials from the Library. If your materials cannot take a trip to an external digitization lab to be converted from analog to digital, then you do what all aspiring DIYers do: you bring the lab to your materials. The New York Academy of Medicine Library has an amazing and significant collection of rare and unique materials that will benefit both researchers and the general public once digitized. Thus, our goal is to develop a robust digital infrastructure to support the creation and preservation of our digital assets internally, particularly rare, fragile and unique materials. The Federal Agencies Digital Guidelines Initiative (FADGI), a collaborative started in 2007 to create sustainable guidelines for digitization, is the gold standard for cultural heritage digitization. In 2016, FADGI’s Still Image Working group released an updated “Technical Guidelines for Digitizing Cultural Heritage Materials,” which updates the specifications for being FADGI compliant. Establishing a robust digital infrastructure means being FADGI compliant while integrating the needs of our users and the strategic goals of the Library. We began the process by conducting an inventory of our resources. The Library has multiple scanner setups and each is good for its purpose. However, no setup was best for digitizing rare materials. Flatbed Scanner: Our Epson Perfection v700 Photo flatbed scanner, used in earlier digitization projects, was good for small flat materials. Prior to our digital setup, we used it to digitize additional items for our William H. Helfand Collection of Pharmaceutical Trade Cards. Book Scanners: We have two Bookeye scanners: a Bookeye 3 and a Bookeye 4. Our Bookeye scanners were used to create images for patrons, but posed complications when thinking about scanning rare books. Our Bookeye 3 scanner with a glass platen is best for large flat materials. Our Bookeye 4 scanner with v-cradle is a workhorse, but posed problems for items with tight bindings that were unable to open 90 degrees. Our Konica Minolta Scan Diva scanner stopped working due to a problem with the software and the company was unable to replace it. As a result, the scanner was no longer usable. The inventory revealed the need for a solution that followed FADGI guidelines for digitizing rare materials, considered the binding of the item, made sure digitization would not damage the item, and used equipment that could be easily maintained. Thanks to the generous support of the Gladys Brooks Foundation, we created a digital lab that combined the old and the new. The digital lab is illuminated by two Profoto strobe lights that flank an old copy stand sitting on a production workbench. Attached to the copy stand is a refurbished Phase One 645DF camera with 80mm lens, and a Mamiya Leaf 50 megapixel digital back. Just off to the right is the digital workstation, which includes a Mac Pro, Eizo monitor, and Capture One Cultural Heritage (CH) software used in the digitization process. Photos courtesy of the Library’s Digital Team. 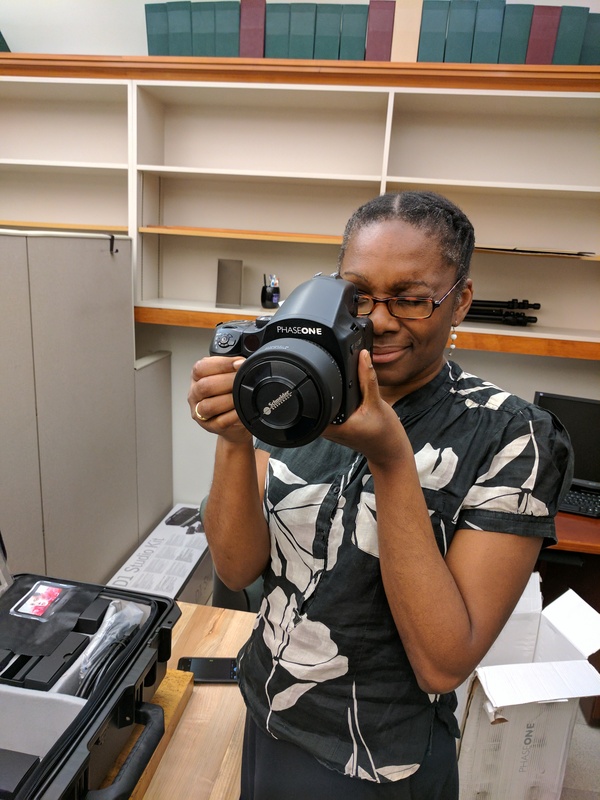 Discussion with our digitization working group and other cultural heritage organizations with digitization labs led to the digital camera setup that was modular and best for digitizing rare materials. Modularity offered the opportunity to grow and develop as the technology changed while making it easy to replace parts as necessary. Thus, if the lights needed to be replaced, we would not need to replace the entire setup, but rather just the lights. The digital camera setup also offered flexibility because there was no set angle at which to open an item. Using book cradles, we can adjust the angles based on the object for best shooting and handling. 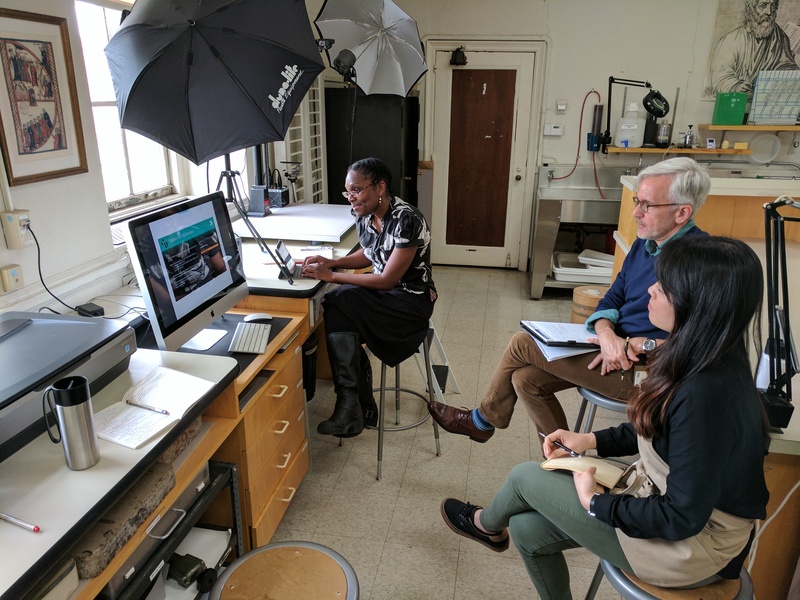 A recent report from the Library of Congress, “Library of Congress Lab: Library of Congress Digital Scholars Lab Pilot Project” provides great recommendations for digital lab design. The research conducted and the recommendations from the report are a model for a digital lab that can benefit us all in our own efforts to digitize and make rare materials accessible to a wider audience. This blog post is the first of series of post from the digital lab. We will share our process and activities, so stay tuned. State medical journals digitized for the MHL consortium. The New York Academy of Medicine Library is digitizing state society medical journals as part of a mass digitization project with the Medical Heritage Library (MHL), a digital curation consortium. The Academy Library is one of five collaborators on the project, along with the College of Physicians of Philadelphia; the Countway Library of Medicine at Harvard University; the Health Sciences and Human Services Library, University of Maryland; the Founding Campus; and the University of California at San Francisco. Together, the MHL team is actively working to digitize 48 state society journals, more than 3,800 volumes that span much of the 20th century. Digitizing the state medical journals will provide open access to quality historical resources in medicine for researchers and the general public, letting them explore connections between medicine and society. State medical journals digitized for the MHL collective project. Evenly splitting the volumes among the MHL team makes the process of mass digitization more manageable and very collaborative. The Academy Library has already digitized almost 50% of the state medical journals assigned to it since Fall 2015. The journals are scanned by the Internet Archive (IA) and are publicly available as part of the Library’s and MHL’s collections on the IA site. Our digitized assets are open for anyone to access and use. Thus far, we have digitized journals representing 24 states and almost 238, 000 images. Scan from Alaska Medicine, vol. 29, 1987. State medical journals are valuable resources that should lead to many new and novel projects for researchers in the history of medicine. Look for more on the project as it progresses.